In a statement released yesterday [Thursday] evening, the new IRA grouping said that following extensive consultation, the three organisations “have come together within a united structure under a single leadership subservient to the constitution of the Irish Republican Army”. A completely new command structure and army council has been established to oversee the running of the new organisation which will combine the resources of all three former groups. It is believed members of the three original groups have already been briefed on the merger. The transition was helped by the fact that a majority of the new IRA’s leadership previously held senior roles within the Provisional IRA at various stages of that organisation’s existence. The new organisation does not include the Continuity IRA. In addition, one or two elements which operated under the name Oglaigh na hEireann [the Irish synonym for IRA] may not have been brought into the new group, particularly in Belfast. In a statement issued by the regrouped organisation’s army council, the IRA said it remained “committed to the full realisation of the ideals and principles enshrined in the proclamation of 1916”. “In recent years the establishment of a free and independent Ireland has suffered set backs due to the failures among the leaders of Irish nationalism and fractures within republicanism,” it said. “The root cause of conflict in our country is the subversion of the nation’s inalienable right to self determination and this has yet to be addressed. It said the continuing British denial of Irish self-determination remained the source of the conflict. “It is Britain, not the IRA that has chosen provocation and conflict,” it said. 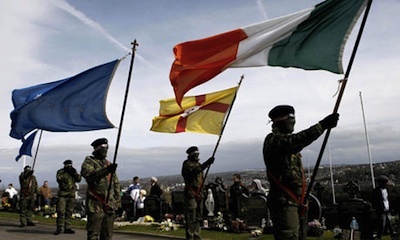 “The IRA’s mandate for armed struggle derives from Britain’s denial of the fundamental right of the Irish people to national self-determination and sovereignty. “So long as Britain persists in its denial of national and democratic rights in Ireland then the IRA will continue to assert those rights. It is unclear what motivated the new development, but the breakaway organisations have reported a surge in support since Sinn Fein’s Martin McGuinness shook hands and greeted the English queen, Elizabeth Windsor, as part of the British royal jubilee celebrations last month. The increased size and relative unity within the organisation will directly challenge long-standing efforts by the political establishment in the North to portray republican militants as small or “micro” groups. For the moment, there seems no possibility of an engagement between the two, but in the future, the organisation’s new combined structure could allow a single, coherent channel of communication. North Belfast Sinn Fein assembly member Gerry Kelly recently described the breakaway IRA groups as “small groupings” but insisted that his party had sought to engage with them. “They have no right to carry out armed actions, the vast majority of which are directed against civilians in republican areas, in the name of Irish republicanism,” he said. One of the group’s involved in the merger, Republican Action Against Drugs, has operated a controversial vigilante campaign against criminals within the nationalist community in Derry. However, last month it began to target the PSNI, triggering a wave of raids and searches in which dozens of homes were ransacked, most recently that of the Sinn Fein Mayor, Kevin Campbell. Other units or groupings involved in the merger include one which carried out an attack which killed a member of the PSNI in County Tyrone last year, as well as others which have used the name Oglaigh na hEireann, or simply ‘the IRA’. While the full extent of the regrouping has yet to be confirmed, it has been reported that the new IRA has membership ‘nationwide’. Meanwhile, in an apparently separate development, the Continuity IRA (CIRA) says it has expelled several members and has a new leadership. A statement issued in Dublin said those acting in a criminal manner and using the name of the CIRA would be subject to “military action”. The group said it remains determined to continue its armed campaign in the north. The CIRA has claimed responsibility for several attacks in recent years, including one in 2009 in which a member of the PSNI was killed. There has as yet been no direct response to the development by Sinn Fein or other IRA groups. The full statement released yesterday is here.